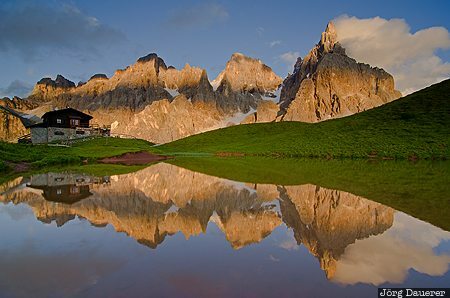 The impressive Pale di San Martino and the Rifugio Segantini near Passo Rolle and their perfect reflexion in the calm water of the Laghetto Baita Segantini illuminated by warm evening light. Passo Rolle is in Trentino-Alto Adige (Südtirol) in northern Italy. This photo was taken in the evening of a cloudy day in August of 2014. This photo is part of the exhibition Reflexions (February 2015). This photo is in the Photo Calendar "Alps". This photo was taken with a digital camera.